Are you looking for reliable electricians located in the south east of England? 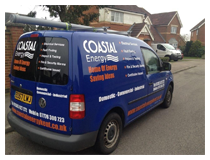 If so look no further than Coastal Energy, based in the coastal town of Dover in Kent. Contact us today for a no obligation survey and quotation with one of our specialist electricians. We are proud members of ‘checkatrade’ in the battle to stop rogue traders. We provide a trusted, professional electrical service with a solid reputation and hold strong relationships with our clients. Our service guarantee is that you can always expect superb quality customer service and workmanship from our team. We are a new company, with a passion for the electrical sector and drive to be an efficient respectable company. Our team are NICEIC approved electrical Contractors and insured by Axa. Our work comes with free expert electrical advice on energy saving ideas either at home or within the work place. We guarantee our work meets current 17th edition regulations and we leave all work areas clean, so the only sign of us being there is a top quality service. Please view our full range of electrical services we provide for both the Domestic and Commercial sectors. Whether you need an electrical contractor for a new build development, help with your own self build project, domestic electrical maintenance, a landlords energy performance certificate, or professional guidance for renewable energy installations – we are the company to talk to.